The eye area of the face is delicate and particularly prone to aging. This is especially true of the under-eye area, which has very thin skin. The following cosmetic treatments can help treat under-eye wrinkles. Botox is a cosmetic treatment commonly used to treat what are known as “crow’s feet,” which are the fine lines and wrinkles beside and under the eyes. It works to relax the muscles and smooth the skin out. Botox eye injections can last anywhere from three to four months. Cosmetic dermal fillers are used to reduce the appearance of wrinkles by plumping up the underlying skin. Over time, our skin loses volume and our facial tissues thin, causing lines to appear. Dermal fillers were designed to help address these concerns by injecting volume back into the skin. There are several different types of substances that can be used in dermal injectables, including hyaluronic acid and calcium hydroxylapatite. However, hyaluronic acid is by far the most commonly used option here in Canada. Depending on the severity of under-eye wrinkles, your surgeon may also recommend a combination of different treatments. 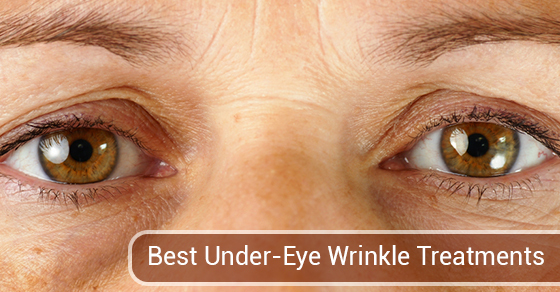 Dermal fillers for under-eye wrinkles typically last between 9-12 months. Thermage skin tightening treatment is a non-surgical treatment that can not only improve the appearance of lower and upper eyelids, but can also smooth out wrinkles around eyes and brow line It does so in just one treatment and requires little to no down time. Thermage skin tightening treatment offers a very natural look, which is why so many are drawn to it, especially those who may be new to cosmetic surgery. Thermage skin tightening is a proven treatment that tightens existing collagen via radiofrequency energy. As you can see, there are many cosmetic treatments at your disposal for treating under eye wrinkles. A consultation with Dr. Skouras will determine which option is best for you. Dr. Skouras will suggest a combination of different treatments for optimal results. If you are interested in cosmetic treatments to remove your under eye wrinkles, such as Thermage skin tightening treatment, consider Skouras Eye and Cosmetic Centre. We are a leading cosmetic surgery centre in Toronto. Contact us today for more information.